Otis pizzeria co-owners Nicole Cook, Jenn Berti, Matt Moreno, Gary Fromm and Randy Helton. Not pictured, Shawna Condray and Nicole Dooley. Matt Moreno crafts another thin and crispy masterpiece. 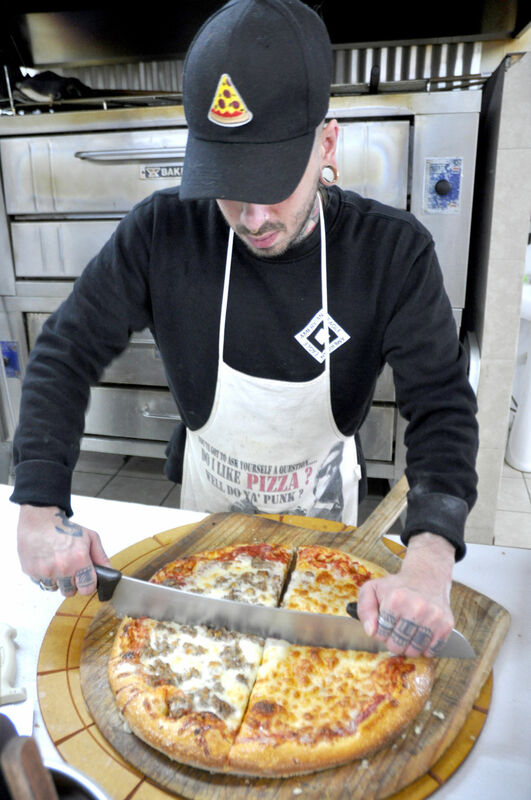 When Gary Fromm, owner of the town of Otis, wanted pizza done just the way he likes it, this life-long entrepreneur did the only thing that made sense — he opened his own pizzeria. While that might seem excessive to some, bear in mind that Fromm is not the sort of person to do things by halves. For example, when he found himself in the market for commercial property in Otis a few years back, rather than settling for a single storefront or two, he bought the whole town. And now, as the driving force behind Otis Pizzeria, Fromm is on a mission to provide great food to locals as well as a warm welcome to visitors on their way to and from the coast. Located east of the junction between Highway 18 and Highway 101, just minutes from Lincoln City, Otis has long been the gateway to the Oregon Coast — and Fromm is intent on rolling out the red carpet with an eatery that serves up mouthwatering cuisine in generous portions. Bestselling varieties include the time-honored Pepperoni as well as The Meat Pie, topped with Genoa salami, Canadian bacon, pepperoni and house-made Italian sausage; and The Otis Pizzeria Combo, which combines all the above with mushrooms, purple onions, black olives and mixed bell peppers. All the pizzas are served up thin and crispy, just the way Fromm learned to love them during his 50 years in Philadelphia. The other thing he learned to love in the City of Brotherly Love is the Philly Cheesesteak. So, in the true spirit of fusion cuisine, it only made sense to combine the two. And for the purists, the regular Philly Cheesesteak combines slow-roasted prime rib with Ameri-can cheese, fried onions and bell peppers, all served up inside a fresh baked Philly roll. Fromm said he has had customers tell him the Otis Pizzeria Philly Cheesesteak is the best they have had since leaving Philadelphia. Meanwhile, a vegetarian Philly Cheesesteak option replaces the prime rib with Otis Pizzeria’s Veg-etabletarian Burger — one of several wisecracks on a menu prepared by a team who refuse to take themselves too seriously. The warm welcome and camaraderie extended by the pizzeria team did not come about by accident. When Fromm bought out his business partner’s share in the restaurant in February, he immediately called in his four main staff members and offered them a five-percent stake in the business. Now Jenn Berti, Nicole Cook, Randy Helton and Matt Moreno are co-owners, something Berti said makes them see the operation through a different lens. The restaurant is nestled amid a thriving business community including the Otis Café, Otis Market & Gas Station, Otis Espresso, Otis Dispensary and the Otis Post Office. Otis Pizzeria proudly proclaims itself as home to the Classic Pronto Pup since 1946, picking up the product line of the former Salmon River Pronto Pup, which operated out of the same premises. The battered hot dogs were born in the late 1930s a few miles north in Rockaway Beach, and the Salmon River Pronto Pup was one of the first places where people could buy pups year-round rather than having to wait for a temporary stand to pop up at the county fair. Pronto Pups take pride of place on the Otis Pizzeria menu and feature prominently on the sign, something Fromm said is a nod to the area’s history as well as a good marketing tool. And with a selection that runs the gamut from burgers and hot sandwiches to salads and soups, no-one should be leaving Otis Pizzeria empty handed. The menu even features The “Cheech & Chong,” a selection of fried appetizers including mozzarella sticks, fried pickles and onion rings — perhaps designed as a tie in with one of Fromm’s other nearby tenants. Otis Pizzeria is located at 1252 N. Salmon River Hwy. and is open from 11 am to 9 pm seven days a week. To place an order, call 541-996-4844 or get $5 off your first online order at otispizzeria.com. Otis Pizzeria delivers to Otis, Neskowin and all the way to the south end of Lincoln City. Through April 1, the delivery fee is reduced from $5 to just $2. Get $5 off your first online order at otispizzeria.com.